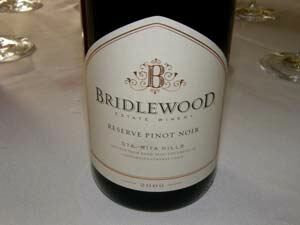 Bridlewood produces a range of premium wines including Pinot Noir, Syrah, Zinfandel, Chardonnay and Viognier from Central Coast vineyards. The 105-acre estate is located on the eastern edge of the Santa Ynez Valley and has 40 acres under vine. The winery's Pinot Noir is sourced from vineyards in Santa Barbara County, San Luis Obispo County and Santa Lucia Highlands. The winemaker is David Hopkins. Annual production is 125,000 cases. The Bridlewood Estate tasting room is open daily from 10:00 to 5:00. Tours are available by appointment (800-467-4100, ext 216).